Discovered two years ago by UC Berkeley scientists Jill Banfield and Jennifer Doudna in some of the world's smallest bacteria, the protein was similar to Cas9, but quite a bit smaller: a big advantage if you're trying to deliver a gene editor into a cell. Plus, because it comes from bacteria that are not found in humans—Banfield dredged them from a database of microbes found in groundwater and sediment—the human immune system should accept it more easily than Cas9. Some doctors fear that Cas9 may create an immune reaction in patients treated with CRISPR therapies. "The immunogenicity, delivery and specificity of a genome-editing tool are all vitally important," said co-lead author Benjamin Oakes, a former UC Berkeley graduate student and current Entrepreneurial Fellow in the Innovative Genomics Institute. "We're excited about CasX on all of these fronts." 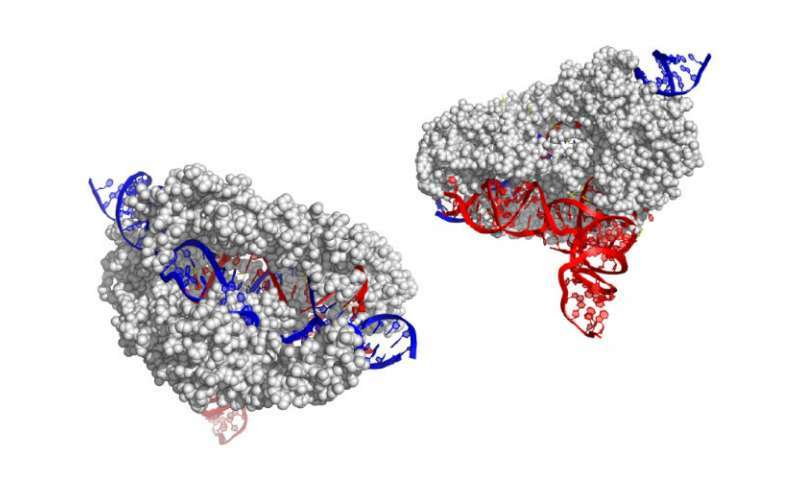 Co-lead authors Jun-Jie Liu and Natalia Orlova used a cryo-electron microscope to capture snapshots of the CasX protein going through the motions of editing a gene. Based on the protein's unique molecular makeup and shape, the researchers concluded that CasX evolved independently of Cas9, sharing no common ancestor. "The first thing that jumps out is how the highly unique domains accomplish similar roles to what we have seen with other RNA-guided DNA-binding proteins. CasX's minimal size, with no fat on the bone, helps to clearly demonstrate there is a basic recipe that nature uses," Oakes said. "Understanding this recipe will help us to better evolve and engineer genome editing tools for our purposes rather than nature's." That's exactly what he and his colleagues are now doing. "The culmination of biochemistry, genome editing and structure experiments within this single study is a prime example of the comprehensive efforts that are underway at the IGI," said Jennifer Doudna, IGI's executive director, a UC Berkeley professor of molecular and cell biology and of chemistry and a Howard Hughes Medical Institute Investigator. "We aren't just looking to uncover the next pair of molecular scissors. We want to build the next Swiss Army knife." CasX ,The Latest Greatest ! Cas9 has yielded its throne already ? 1) Remove Huge Size Gene of Elephant to make it a pet (that will survive on grass). 2) Remove Tails of Dogs & Cats that spread their horrible material all around the house. 3) So many in that line that can be thought of. CRISPR has substantial defects as it produces other unspecified alterations so the search was on for something smaller and here it is, a bacteria not found in humans. What could possibly go wrong? Welcome to the designer human era. Now that we have this advanced technology in our hands, I am still waiting for the day when it is going to be used for achieving really great things. We are leaving everything to nature, as though we too cannot make such novel things ourselves. Point in focus is 'varieties of fruits and seeds and a few week time turning a 1-celled zygote into chicken'. Even though there are so many kinds of trees & microbes already to tinker with, we still are not being able to make a tree to grow chicken meat or beef. (Remember that yeast makes alcohol) ! Harvard Univ. on Microbial Manufacturing - Microbes producing key compound, streptozotocin, an antibiotic compound used to effectively fight cancer. Only Monkeys have Tails. Apes(chimpanzees, bonobos, gorillas, orangutans and gibbons) do not. Oy, the usual barrage of unrelated technologies and fears. - "CRISPR has substantial defects as it produces other unspecified alterations". There are many developments of improved specificity (say, https://www.news-...SPR.aspx , https://www.genen...eotides/ ). - "as though we too cannot make such novel things". From the article: . "Understanding this recipe will help us to better evolve and engineer genome editing tools for our purposes rather than nature's."" Healthy human, you mean, the ethics involved so far is on fighting disease and damage. But if not, so what, individual changes can't spread in the same way plastic surgery can't. "we still are not being able to make a tree to grow chicken meat or beef". GMO is suitable for small changes. On the other hand, we can grow meat of any animal in vats, without the use of antibiotics too. I have tried some at my local university, haven't you? CRISPR/Cas is not needed for that (but could possibly up efficiencies in the future). Plastic surgery is not hereditary, genetic engineering of babies obviously is. So it is quite different, and for the better. You fix a health issue or a cosmetic defect in an embryo, you fix it for all the descendants as well.